It’s amazing the things that you can lose in a dresser drawer. When I was a kid things would go into one of the drawers and vanish for years before I found them again. I think somewhere there is a dresser drawer that still has some haloween candy in it that I never got around to eating. I know I haven’t replied in a while, but I read every day. Keep up the funny! My backpack did that on occation. One of my teachers comfirmed it in middle school when she watched me put the assignment in my backpack and was, herself, unable to find it. Glad my back pack never did that! 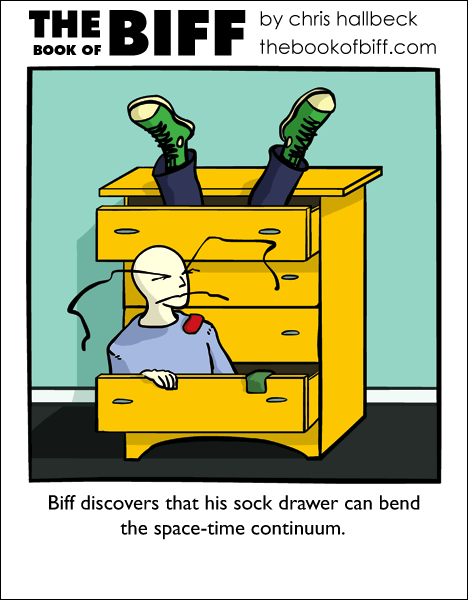 Whose sock drawer can’t bend the space-time continuum? I mean, come on, it’s a standard feature and part of the laws of space-time. I believe guinea pig is the word you were looking for. Anyway, just finished reading all the Biff comics from first to well… not last, but this one! It’s spelt like this: Guinea pig. just a helper, so anyway, im a new poster, and just find this comic almost unbelieveeably funny! Strangely…I agree with this comic….I never dared look inside my sock drawer for some reason. Now I know why. My cousin used to have a zombie in his. I’ve encountered a mall like that before! My friend’s backpack does the same thing. He can put stuff in it, and the next day, it’s nowhere to be seen! Actually Chris I have a good story for you on that one. When my Dad was a bit younger he was out hunting with one of his friends and when they got back they had their rifles still.Coming inside they emptied them. But one round fell out and down under the couch. Now both my father and his friend not wanting me or my brother to find this and hurt outselves at that young age moved the couch and looked under finding nothing. Making sure to keep checking they even took apart the couch and searched it from top to bottom still nothing. The round just completely dissapeared. And my dad and his friend both confirm that story. Because things in my last house just dissapeared on me. Cards and such. Still no known explaniantion for the round dissapearing. Well, my family keeps their socks in a picnic basket ………. one good thing is you can completely invert it every now and then……. I found a left over easter egg in my underwear drawer when I was six. It sounds like Reikon Ame’s got a case of haunted house. I’d say the ghost was my Dad, collecting useless crap and whatnot, but he’s still alive. Same thing with beneath couches. Well Stevith you actually hit the nail on the head. I did live in a house with ghosts. My dad has a story of his brother in law, and you can ask him as well. While working at our house he was in the garage and my dad left. What he says happened was the lights started to flash on and off and the radio was running up and down the dial. And to this day refuses to enter that garage. this is one of the greatest things that i have ever seen. Once again, Biff manages to break the laws of physics. Biff always bends the laws of physics, he does it just by being alive! My sock drawer DOESN’T do that. I still have all my socks accounted for, despite using the dorm laundry room. My drawer must be defective. What I want to know is, why did Biff dive headfirst into his sock drawer? He obviously didn’t yet know his drawer was a Roddenberrian anomaly, so that can’t have been his reasons. Maybe he was just thinking how cushy his socks looked. In theory, religions answer questions that science cannot (with a few exceptions) then this is a religion itself? All hail the drawer gods! We had a black hole behind the cubbies in my elementary school. Things would vanish randomly, things that we’d put in full view, only to reappear the day after we needed them. No amount of cubby-dismantling could find where the items went to in between. HA! I lost my whole _dresser_ once. *ahem* when I was six or so, I had a sticker collection that I put all over my dresser. My room was so messy one day, I couldn’t find the dresser… sad, but true. it took a dilegent five-minute search to unearth it. Heh. I once put a frog in my empty bottom drawer for a while when I was a little kid, right? I forgot about him rather quickly x). three months later, he was in my top drawer (with the socks) completely healthy. interesting. When I was in fifth grade, I had a backpack with wheels. I swear, if I tried to crawl into it to find something, I probaly would have been lost for weeks. Yeah, last year, I borrowed my brother’s manga comic book and I stashed it in my backpack and one week later, I couldn’t find it. Another week later, I found it. I guess sometimes this space-time continum thingy can happen with backpack. I don’t know about my sock drawer, but when I go on trips (usually camping), sometimes my luggage will mysteriously vanish unless I carry it with me the whole way up instead of putting it with everyone else’s luggage. The disappearance isn’t limited to luggage, but it’s one where I can be certain that I didn’t simply misplace the lost item–I have witnesses who saw me put my backpack right there in the truck, and now the truck is empty, and nobody can find the backpack I brought, and it’s the only item missing–and someone was behind the truck the whole time, so if it had fallen out, it would have been seen. Sorry, that subject tends to get me into rant mode. I once got an easter rabbit made of chocolate. I didn’t eat it until next January. We all know what really happens to socks. Sometime when you are not looking they get out of your drawers, and then shift into a parallel dimension where socks, and other things inexplicably appear in sock drawers, backpacks, lockers, etc. By the way, I only started posting recently, and i want to say good job Chris, and keep up the good work. Is the drawer made of Mahogany? Sorry, that was a lie. It was so delicious and moist.